Mr S wore his new waistcoat but it’s hard to see under his jacket. He also got his new hat from Mr B, so he could upgrade from his knitted cap. There are more photos here, including a fabulous stuffed leg of lamb. 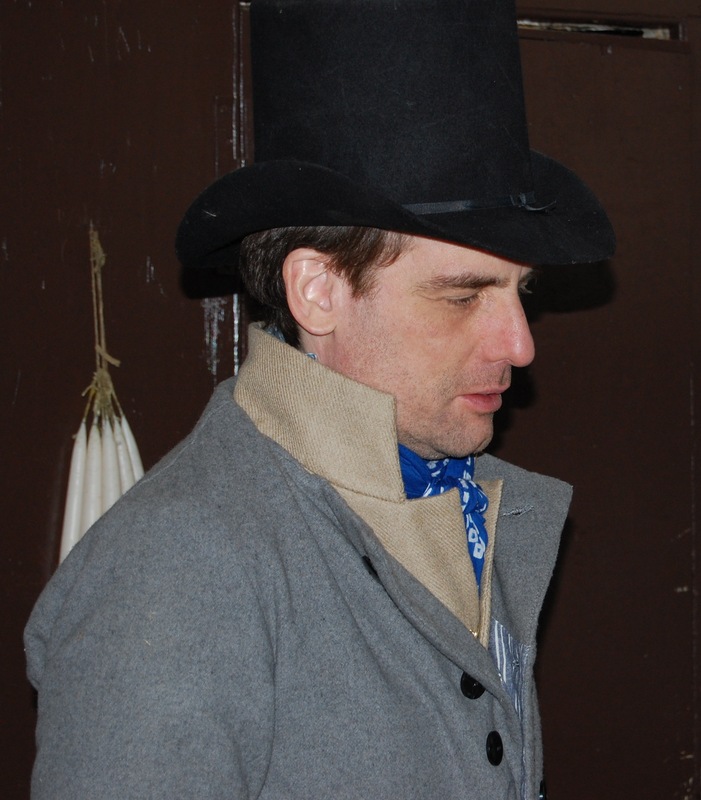 For mid-day Saturday, we ate a meat pie (pork and apples), sugar cakes, coriander biscuits, bread and molasses bread, all brought from home, along with hat from the farm boiled with parsnips, potatoes, carrots and onions and a carrot pudding. We also made a potato-apple-onion pie for the evening meal, though Mr S, the Young Mr and I did not stay. There is a limit to what the child will tolerate. Sunday, we arrived in time for Mr S to make more fence pegs, while I joined the kitchen to make soup with ham, squash, parsnips, and onions, which we ate with bread and cheese, and the last of the sugar cakes, for lunch. All the while, a leg of lamb was cooking, masterfully prepared by Mrs B, and stuffed with cubed bread, onion, ham, sage and onion. To go with it, we made a rice pudding with apples, wilted greens, salad, squash pudding, and stewed apples. The sauce for the lamb was particularly fine, with drippings, minced onions, what we think was whiskey, butter and cream. I learn so much cooking with Mrs B! The cats wanted, but were disappointed. 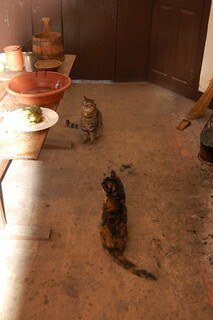 They were calmer on Sunday, though extremely attentive kitchen assistants both days. Pity they don’t do dishes. There were plenty to wash. 1799 was definitely greasy. Even the striped cat feels a little greasy, but that could be because he’s handy to wipe your hands on. 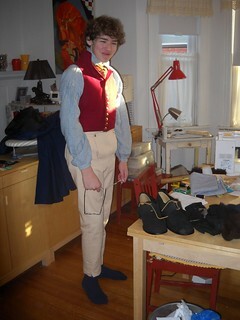 Now it’s on to sewing for something else, though whether that will be wool trousers or clothes for Washington’s Birthday, I don’t really know.